Kerith Overstreet is the winemaker at Bruliam Wines. When she was small, her dad used to say, “You can be whatever you want after medical school.” So she did. After completing medical school (U. of Rochester), residency, and two fellowships (UCSD), she thought winemaking sounded more fun. So she enrolled at UC Davis to study enology and catapulted into the 2008 harvest. Starting with a single barrel, Kerith has grown Bruliam Wines to 1000 cases a year (plus/minus). It’s mostly single vineyard pinot noir with a smidgen of Rockpile zinfandel. With delight and an “OK” from the CF-NO (aka the hubby), she added chardonnay in 2017. Cherishing her grower relationships, Kerith has aligned herself with top vineyards and growers to supply her fruit. Today she cherry picks her fruit from the top vineyards in Sonoma County, Santa Lucia Highlands, and her own Torrey Hill vineyard in the Russian River Valley. 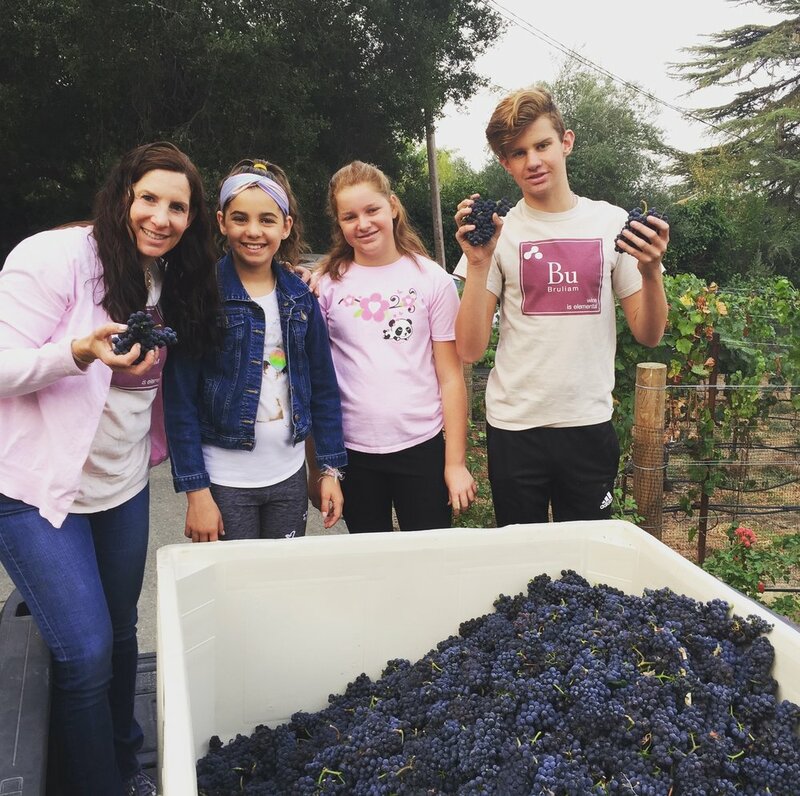 Kerith is a triple-threat: winemaker, former medical doctor, and mom to three kids. Her final baby, Bruliam Wines, honors her first three: “Bruno, Lily and Amelia.” Of course, the “Bruliam” name and logo riff on the Periodic Table of Elements, with a sly wink to her former medical career. Although her deepest passion is for making wine, Kerith manages all of the day-to-day winery operations. She also holds the following titles: Chief of Grower Relations, Head of Marketing, Director of Sales, and Go-to Tank Sanitizer. She writes all of the copy for the website, labels, tasting notes and tech sheets. So yeah, one could say that she basically holds every winery position herself, with the exception of spreadsheets. The CF-NO handles Excel. Because of Kerith’s unique, dual perspective on academic science and hands-on winemaking, she is often asked to speak at industry events. Sometimes there is even an audience. It’s been ten years, and my dad still tells everyone he knows to “drink beryllium.” While we love free advertising, we cannot condone such dangerous advice. On the other hand, you’d think he’d finally get the grandkid tie-in. Clearly, cadmium, boron, and polonium are already taken, so we've settled for our own imaginary element. But the faces behind the name are very real. “Bruliam” is actually an amalgamation of our three children’s names – Bruno, Lily, and Amelia. But rather than sell out our adorable progeny to shamelessly promote our brand, we settled for a logo that riffs on the Periodic Table of Elements. Instead of an atomic weight and an atomic number, we have a single dot for Bruno and a double dot for the twins. Yup, one part nerdiness plus molar equivalents of love and passion makes for great wine. 10 years. Whew. A decade. The big one-oh. X. A tenner. Yup, 10 years of Bruliam Wines. To celebrate this milestone, we have rolled out a new logo, new labels, and this new website. Same color. Same iconic Bu box. Same dots to represent the kids. But refreshed. More refreshed than we feel parenting teenagers. Look for the new labels to roll out in conjunction with our 10th harvest, debuting with the 2017 rose of pinot noir in Spring 2018. Read more about our new look here. Kerith and Brian met in 10th grade at La Jolla Country Day School in San Diego, CA. We were married on October 16, 1999, and we now are the proud parents of three great kids (well, usually great). It’s tough to track our love affair with wine to a specific moment in time and place, but one of our earliest joint memories of wine dates back to the summer of 1994. Kerith had just graduated from Cornell and came out to visit Brian in Berkeley. We decided to take a day trip up to Napa where Brian planned on wooing Kerith with a romantic picnic. We stopped at Mondavi because, candidly, that was the only winery Brian knew by name and sight along Highway 29. After we picked up a couple of bottles of their cheapest house red and some food from a now defunct, local deli, we started driving around looking for our ideal picnic spot. Before long Brian found a place with a big lawn, lots of shady trees, and no one in sight. We laid out the picnic, popped open the wine, and Brian proceeded to work his magic. Apparently his “magic” wasn’t quite working that day since after a mere twenty minutes and a quarter of a bottle of wine, Kerith was already asleep. And right then it happened – a guy in a bathrobe and slippers sauntered by. Brian tried to ignore him as best as possible, but pretty soon similarly clad gentlemen were cruising by and around us, like we were living a scene out of The Twilight Zone. Brian woke Kerith, and we quickly packed up our picnic and climbed back in the car. And thus began our crazy affair with wine. In the years since, we’ve had many wonderful wine experiences, some high brow and quite a few low brow. We’ve survived our cult-cab obsession of the dot-com boom, barreled through the barriques of Tuscany’s major Brunello labels, and enjoyed many an overpriced bottle of red Burgundy at top restaurants state-side. We’ve even volunteered for a blind tasting of box wines (paired, of course, with Frito casserole). Through it all, wine has become elemental, a part of our everyday life and a source of many cherished memories. Wine with a Conscience, Wine with Heart, Wine with Character. At Bruliam Wines, our passion for wine and family imbues everything we do. Every bottle pays tribute to our life long, crazy love affair with wine and each other. We think that wine is elemental – elemental to a day well savored and a life well lived. Winery life is woven into the fabric of our family life. Nothing makes us prouder than showing our kids what we have built and created. Working with the best grape growers in California, Bruliam Wines is deeply committed to their fruit. This relationship is something of a sacred pact. In exchange for access, we promise them a wine that is expressive of their vineyard, reflective of their farming, and brings pride to our partnership. Writing their vineyard name on our bottle is an expression of our long collaboration, through many cycles of vine dormancy, bud break, and harvest. The importance of our grower relationships cannot be underestimated. Each of our low yielding, hand harvested* and hand sorted vineyards fully expresses the unique terroir of their microclimate and the stamp of their farming team. And so it is with this understanding that we can promise you that each bottle of Bruliam Wines is something really, really special and utterly delicious. *Oh, did we mention the part about hand harvesting? By a team of Raven-haired, Pre-Raphaelite virgins at the stroke of midnight, beneath the brave o’erhanging firmament, that majestical roof fretted with golden fire and a canopy of sparkling stars? Oh yes, we take “romantic copy” (& Shakespeare) very seriously. At Bruliam Wines, we have always subscribed to a strong charitable mandate. To date, we have made donations to over 80 unique charities selected by our mailing list members and our restaurants partners. We also bottle 12 magnums per vineyard per year, all for charity auctions. Check back often and follow our social media links for an opportunity to decide our next charitable beneficiary. We offer new chances every year.